(Nanowerk News) As the temperatures rise and Americans swarm to the beach, they slather on sunscreen to protect against the sun’s harmful UV radiation that causes skin cancer. As they splash and swim, few give thought to whether the chemicals in the lotions and sprays are safe for marine organisms such as the fish and corals living in these coastal zones. The sunscreens widely available belong to two major categories: physical and chemical. Physical sunscreens contain tiny minerals that act as a shield deflecting the sun’s rays. On the other hand, chemical sunscreens use many synthetic compounds that absorb UV light before it reaches the skin ("Ultraviolet radiation and the skin: Photobiology and sunscreen photoprotection"). But these lotions wash off in water. For example, for every 10,000 visitors frolicking in the waves, about 4 kilograms of mineral particles are washed into the beach water each day ("Sunscreens as a Source of Hydrogen Peroxide Production in Coastal Waters"). These minerals catalyze the production of hydrogen peroxide, a well-known bleaching agent, at a concentration high enough to harm coastal marine organisms. In fact, up to 14,000 tons of sunscreens are released into the water each year. Active ingredients in these sunscreens, minerals and synthetic organic compounds, are putting 10 percent of the global reefs under stress, including 40 percent of coral reefs along the coast ("Toxicopathological Effects of the Sunscreen UV Filter, Oxybenzone (Benzophenone-3), on Coral Planulae and Cultured Primary Cells and Its Environmental Contamination in Hawaii and the U.S. Virgin Islands"). One of these ingredients is oxybenzone, a synthetic molecule commonly used in chemical sunscreens and known to be toxic to corals ("Sunscreens Cause Coral Bleaching by Promoting Viral Infections"), algae, sea urchins, fish and mammals: A single drop of this compound in over 4 million gallons of water is already enough to endanger organisms. Unfortunately, its concentration in coastal water is already significantly higher than its toxic limit, though not yet deadly, and might be accelerating coral bleaching ("Climate Change, Human Impacts, and the Resilience of Coral Reefs"). To save their marine ecosystem from further destruction, legislators in Hawaii passed a new law banning chemical sunscreens containing oxybenzone and another harmful ingredient, octinoxate. The law will take effect January 1, 2021. Protecting ourselves from UV rays is nothing new. Many organisms including microbes, plants and animals have evolved ways to guard themselves. These organisms produce small molecules that absorb UV rays and block radiation from entering cells and damaging the DNA ("ARTIKEL"). Unlike physical and synthetic chemical sunscreens, these naturally available compounds are environmentally friendly and biodegradable. As such, these natural products have the potential to be safer compounds for commercial sunscreens. In my laboratory in the College of Pharmacy at the University of Florida, we are interested in combing the world for naturally occurring chemicals that have applications in health, agriculture and environment. 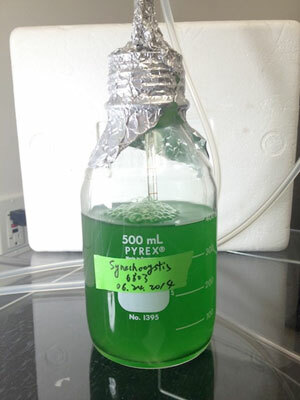 Recently, my colleagues and I have discovered a more efficient way to harvest shinorine ("Ultraviolet radiation screening compounds") – a natural sunscreen produced by microbes called cyanobacteria.